All about the tricks my late ex-wife has been playing lately. Keith and I moved into our current abode in December, shortly after my ex-wife, Mary, had passed away from cancer. I had been her caregiver and roommate; after her death I inherited what furniture she had, including a bed and matching bedstands. Keith and I each make heavy use of the tops of our bedstands, but I don't normally use my bedstand drawer for anything at all. My computer office is across the room from the bed. One day in June, I was working on the computer (on this web site, in fact) when suddenly the thought popped into my head that Keith might have been storing paper wrappers in my drawer. That's because I had discovered, some months ago, that he had been doing that; and I asked him to stop. But I'd never actually bothered to check up on him. But now I had this idée fixe that Keith had been secretly storing trash in my bedside table, that I couldn't put out of my head. I did recognize it as not likely, but I got up to check, anyway. The drawer was empty, as I had last seen it. Wait, no it wasn't! There was an item in it. Right in plain sight. My first thought was that it was a makeup brush; and since neither Keith nor I wear makeup, I knew it couldn't belong to either of us. It seemed likely it had been Mary's; and I sent the above photo to the kids. "That's not a makeup brush, Papa," my grandson, Zachary, pointed out. "It's one of Grandma's paintbrushes." Zach should know; Mary used to show him how to do the paint-by-numbers art that she enjoyed. Knowing the kind of brush, however, didn't explain how it got there, as I was sure it hadn't been there any of the other (admittedly, few) times I'd looked. And it wasn't hidden or stuck anywhere; it was lying in plain sight, as if it wanted to be found. It was hard not to see this as a message from Mary in the Beyond. Especially since it had started as an uncharacteristic compulsion to look in a rarely-opened drawer. In any case, the next day I decided to do my semi-periodic throwing out of trash from my car. I do this every now and then and have a routine. 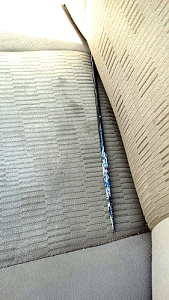 I start in the front passenger seat floor, up to the seat, fold the back forward to get anything that's fallen between the seat and the back; and under the seat. I then repeat for the other seats. I don't usually find much between the seat and its back other than the occasional penny or dime. But this time was different. 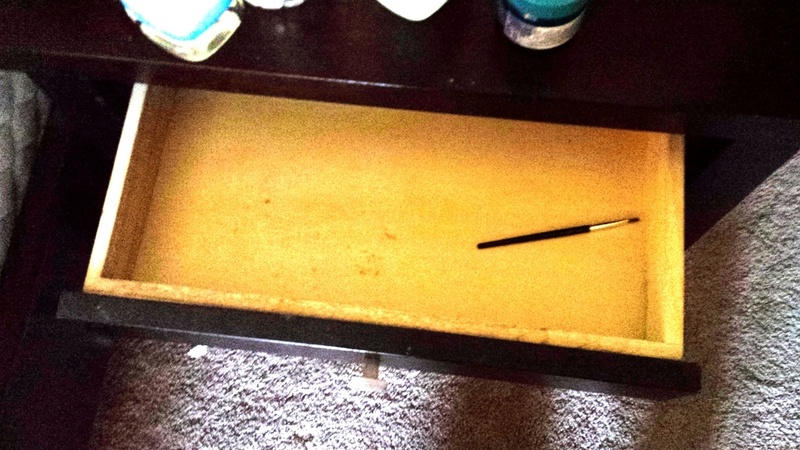 There was another paintbrush hidden there. Two paintbrushes in two days? In places where they shouldn't be? Belonging to neither Keith nor I? Clearly, this was a message. And it seemed to be from Mary, despite the fact that she is no longer "with us". A few days later, I turned on the living room lamps. They are plugged into a switched outlet; I hit the wall switch and they go on or off. 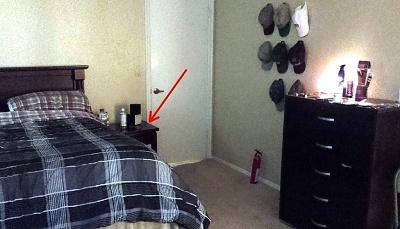 Except, this particular evening, the lamp nearest the fire popped after lighting briefly, and went out. Obviously, the bulb had burned out; so I removed it and put in a fresh one. But—the new one didn't work, either. By now, Keith had come into the room, observed what was happening, and suggested I try the switch on the actual lamp, itself. "No," I assured him. "I saw the light go off." But I tried it anyway…and the light went on. So then I had to put the old bulb back in, and check that—and it worked! But I had seen the lamp light up, then go out, accompanied by a popping sound. Which could have been the switch on the lamp being turned; but I was the only one in the room at the time. Well, the only visible person. 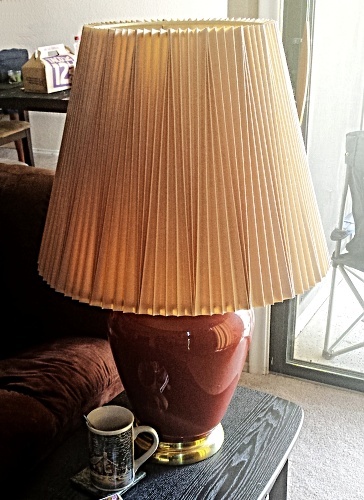 Thing is, there's a story about that lamp. It, too, came from Mary's apartment, where it had flanked the same sofa I now have. It was also plugged into a switched outlet there. But Mary would often turn off that one lamp by its own switch, and I would have to turn it back on by that switch, so the wall switch would again work. And that meant bending over (my back isn't what it once was) and fumbling to feel for the switch I couldn't see. It was annoying, but Mary was so sick I never said anything to her about it. So now, with me actually witnessing, it appeared she had, again, left me a message, one that only I would recognize. That's a key to receiving messages from the afterlife. The messages will always be intensely personal, and completely unconvincing to anyone other than the recipient—for whom the message will be totally convincing. Here's another example. Keith and I watch movies and TV episodes most evenings. None of this is on commericial television, which we choose to not have; we wait for the series to end and then watch it on DVD. Among the series we've been watching are Northern Exposure and The Big Bang Theory. We watch the episodes in order, and do not know what stories are coming up. So, on September 27, we decided to watch an episode of each of those two series. 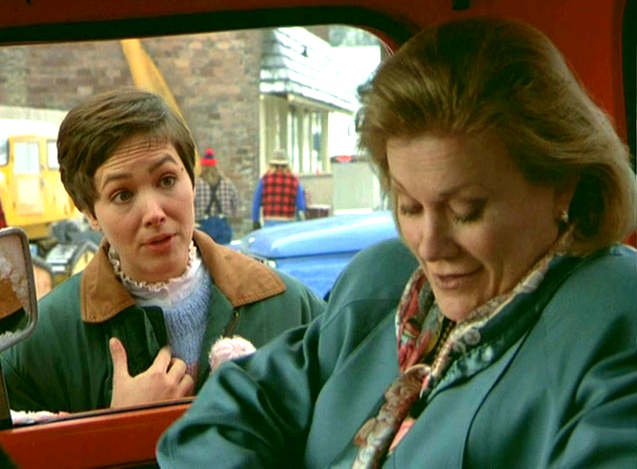 The Northern Exposure episode was entitled "Burning Down The House", and, in it, Maggie received an unexpected visit from her mother, who had information for her. The Big Bang Theory episode was entitled, "The Maternal Capacitance" and it, too, featured an unexpected visit from Leonard's mother, Dr. Hofstadter…who had information for him. So, both episodes were about mothers coming to visit with messages. And what's the punchline to this? Well, we watched these episodes, without any sort of planning, on September 27. That was Mary's birthday. And this was the first occurrence of her birthday since her passing. It's nice to know she is still painting, though it seems she is now using metaphysical paintbrushes with which she can now paint some decorations into our lives…like the assurance that she is still around, watching over us.